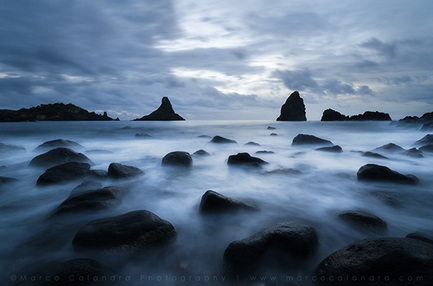 The workshop "Acitrezza" organized by Marco Calandra gives the possibility to everyone who love the photography to share a passion with other people. The purpose of the course is to learn and/or enhance the knowledge in landscape photography. 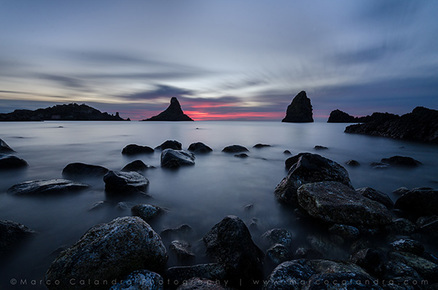 The landscape of Acitrezza is characterized by the "Faraglioni dei Ciclopi": eight basaltic rocks (three in greater evidence) that, according to legend, were thrown by Polyphemus to Ulysses during his escape. The area of Acitrezza has also been the subject of the novel "I Malavoglia" written by Giovanni Verga in 1881. 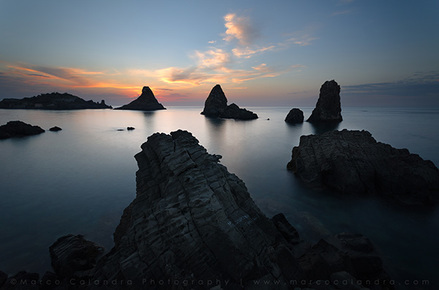 The workshop will be characterized by practical part on the field, at Acitrezza and a theoretical part of landscape photography and post-production. Like any seaside town, you can not predict the weather conditions (wind, clouds, etc.) that will arise on the day indicated, but it will also be possible capture breathtaking scenery. PS: If the weather conditions are gonna be negative and will not allow a regular running of the workshop, this will may be subject to shifts of date, or in other cases refund of amounts already paid. 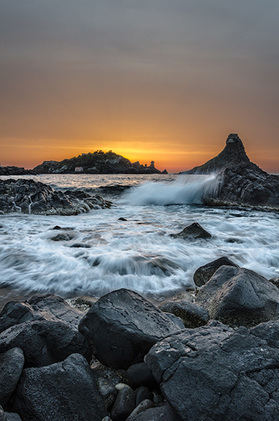 Know and understand the main issues that concern the landscape photography. Understanding and knowing how to use the tools that a landscape photographer needs to manage the light. Understanding how to use the different shooting modes in the camera. Understanding the best use of depth of field, exposure time. Basic rules and advanced composition. Postproduce (non-destructive) a shot to make it perfect. Clothing: It will depend on the weather. I recommend to bring the boots (so it will be possibile to enter the water) if you want to take photo at a very low level, very close to the sea. Everything that was not set out under the heading "price"
You can try the equipment of Marco Calandra to understand the information explained during the day. The course includes a practice session (dawn) and a theorical session (theory of shooting and post-production). The course will be made equally if it is raining softly. The booking of the course is effected after you have the payment of the first part of 25 EUR through PayPal. If the participant will not be present during the course, the payed part will not be refunded. If the course will be deleted, there will be the possibility to have the paid part refunded, or there will be the possibilty to change date. To book the course please contact Marco Calandra by sending an email to marcocalandra@outlook.com, or contact him via the contact form.